The XK brand was launched in 2015 and it is the luxury arm of WLToys. Being the crack division of WLToys means XK produces some really impressive drones. Despite the brand’s “premium” reputation, XK products aren’t terribly expensive. 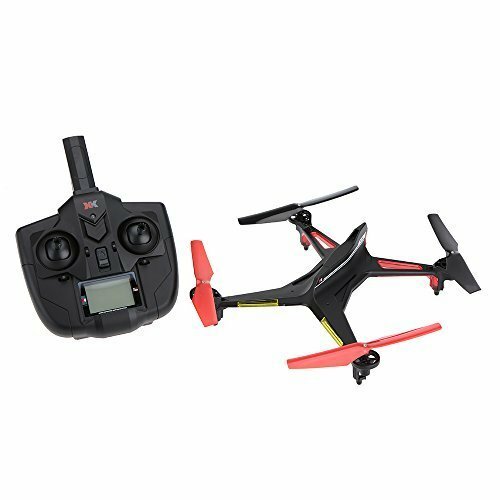 For example, the Alien X250 sells for about $50, which is a reasonable price for a 5.8GHz FPV toy drone that comes with an FPV monitor. The XK Alien X250 flies remarkably well and it is designed to look and feel like a premium product. This great stylish looking RC quadcopter is also packed with great features and one of the awesome features is that this drone contains high precision air pressure needle, which is able to feel the air pressure and then to adjust the height of the flight. This is very useful to reduce electricity consumption and ensure the safety of flight. The model featured in this review is the X250 Standard. This is the base model that does not come with a built-in camera. This model is also available as a Wi-Fi FPV (First Person View) variant. The manufacturer claims that this drone has a control distance of 300 meters, which is quite an impressive claim because most toy quads this size have a control distance of no more than 100 meters. The package doesn’t include camera, but you can hang micro 5.8G FPV camera on the X250, so that you can make use of it to capture photos and video. The XK Alien X250 simply looks and feels a lot more premium than most toy drones on the market and this is what sets this drone apart from its rivals. The X250’s minimalist form has a futuristic stealth fighter appearance, which means that there is no bloated x-shaped body here. This drone has sleek lines and curves in the right proportions that intersect at the right places. The motor mounts on the drone double as landing legs, which means that there are no conventional landing skids. This feature is very useful because it makes it almost impossible for the X250 to topple over during hard landings. Front and rear LED lights are beautifully integrated into the motor arms. There is also a battery carriage at the bottom that also doubles as a camera mount, and this mount can also be used to attach WLToys accessories, such as a bubble blower. Transmitters that come with Chinese toy drones are generally quite ugly. However, that’s not the case with the X250’s transmitter. Even the transmitter shares the same design aesthetics as the drone itself and it looks like it was designed by someone who produces things for a James Bond film set. Overall, the X250 is unique and stands out from the rest with its neat and svelte appearance. Despite weighing only 100 grams, the X250 is remarkably stable and precise in the air. Everything about this quad seems precisely dialled in that it is simply great fun to fly and the X250 is just one of those toy drones you want to own just for the fun of flying. With its well-designed LED lights (red at the rear and yellow in front) the drone also looks great in the air. These lights do a good job in visually helping you with the drone’s orientation. Moreover, the X250 provides Fail Safe Function, which means that the LED will flash when your drone is out of control and then the drone will land in automatic way. Also, the LED lights can also be turned off manually should you need to conserve some battery power. The XK Alien X250 is equipped with a nice 3.7V 800mAh Li-Po battery and has a flight time of about 12 minutes. The battery takes about 60 minutes to completely charge. The drone also has low voltage alarm function, which is a considerate design and guarantees a safe flying for you. This means that all LED lights will flash to remind you when your drone is under low voltage status. The drone has the 6-axis gyroscopic stabilization system. This feature largely improves the drone’s stability and its ability to resist strong wind. The X250 is also capable of the usual aerial acrobatics such as 360-degree flips and to perform flips, press the right stick inwards and then move the right stick in the direction you want the drone to flip. The X250 also comes with one-key-return and headless mode features. It is important to note that the one-key-return feature here does not use GPS guidance and it is merely used to bring the drone flying back in the direction of the pilot’s original position. It is a great feature to have if you’ve somehow lost orientation or control of your quad and need to bring it back safely, although it will not cause the drone to land precisely where it took off. The XK Alien X250 adopts 2.4GHz communication technology and its control distance is more than 300 meters. The drone is also compatible with FUTABA S-FHSS. These features bring you an amazing flying experience, and it has no interference by other transmitter. The XK Alien X250 is great drone for beginner pilots. This drone is sleek, thin and has a unique look that sets it apart from its rivals. The X250 is perfect choice for those who are looking for a toy drone that looks great and flies great. This drone is very affordable and it’s really quite hard trying to find anything that looks and flies better than this quad. The XK Alien X250 is also capable of carrying a camera (both Wi-Fi and 5.8GHz cameras available). This drone is also capable of carrying some other fun accessories from WLToys, such as a bubble blower and grappling hook and basket set, and thanks to the optional WLToys accessories this drone can provide many hours of fun. If you’re looking for a decent beginner drone, you really can’t go wrong with the Alien X250 because this drone has affordable price, neat design and great flight performance.